NASA’s Lunar Reconnaissance Orbiter views the Apollo 16 S-IVB impact site on the moon. After decades of uncertainty, the Apollo 16 S-IVB impact site on the lunar surface has been identified. S-IVBs were portions of the Saturn V rockets that brought astronauts to the moon. 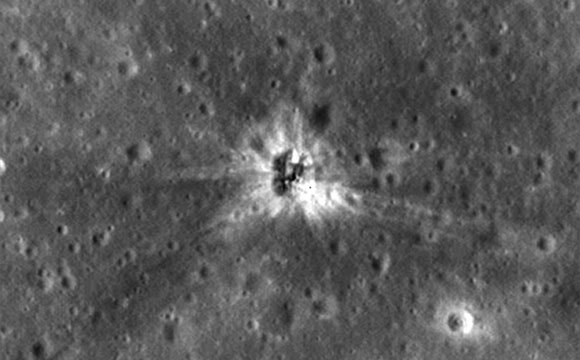 The site was identified in imagery from the high-resolution LROC Narrow Angle Camera aboard NASA’s Lunar Reconnaissance Orbiter. Apollo 16’s S-IVB stage is on Mare Insularum, about 160 miles southwest of Copernicus Crater (more precisely: 1.921 degrees north, 335.377 degrees east, minus 1,104 meters elevation). Be the first to comment on "Lunar Reconnaissance Orbiter Reveals Apollo 16 Booster Rocket Impact Site"